We’ve all heard of “Flash Mobs”; groups of people that assemble suddenly in a public place and perform a dance or act for a brief time. It’s sole purpose is to make people smile. Another new craze just happened Sunday, Oct. 18 right in front of Sugar Fix Dental Loft! Pure Barre- Lakeview hosted a “Pop-Up” event. It is such a cool idea because “buzz” is created through social media; Pure Barre posted on their Facebook page on Sunday morning at 9am that at 11am they would be ready to teach a free lesson to anyone that wanted to show up! What a cool event! Pure Barre is a total body workout that utilizes the ballet barre to perform small, isometric movements, which burn fat, sculpt muscles and create long, lean physiques. 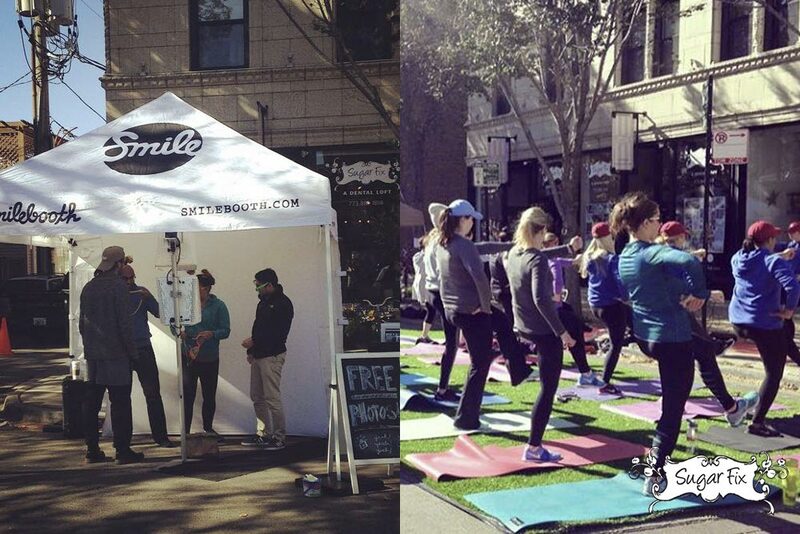 In addition to Pure Barre Lakeview being there, Smile Booth was there as well to take free pictures for people. Dr. Emery absolutely loves the community that her dental practice is in! There are so many great businesses around Sugar Fix Dental Loft! Thank you Pure Barre for hosting a pop-up in front of us!